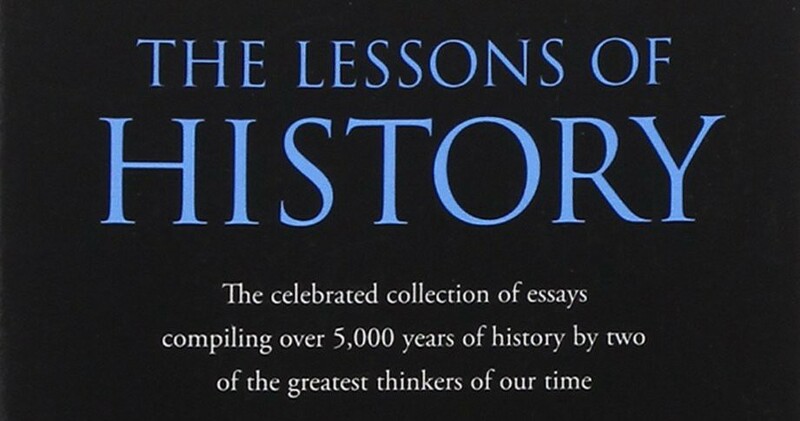 I recently read the Lessons of History by Will and Ariel Durant. The book is essentially a self-authored Cliff’s Notes of their 11 tome The Story of Civilization and it’s incredible. In the spirit of summary², I’ve tried to jot down some of the more meaningful passages for me in bullets below and wanted to share them. Note: I didn’t put quotes around anything because none of the thoughts below are mine. You can assume they are either direct quotes or close paraphrases. I really recommend you read the book: it’s only about ~100 pages… or listen to the audiobook which has interviews with the Durants at the end of each chapter. Knowledge of past events is incomplete, inaccurate, clouded by missing evidence & biased historians. Most history is guessing, and the rest is prejudice. Conclusions from the past to the future are made more hazardous by acceleration of change. Human history is a brief spot in space. Geology changes every day: sea encroaches on land, land on sea. Mountains rise/fall, valleys become deserts, etc.. Climate no longer controls us but still limits us. A tornado can ruin in an hour the city that took a century to build. If temperature changes by 20%: thriving zone→ lethargy. Civilizations grew along water. It’s the life of organisms & towns and cheap transport for trade. In 1492 oceans trumped seas. Then airplane changed the map of civilization again as trade routes don’t have to follow the rivers anymore. Coastal cities will lose some luster. Landlocked countries will gain power. History is a fragment of biology. Laws of biology apply to history. First lesson is life is competition. Life is peaceful when food abounds, violent when mouths outrun the food. Second lesson is life is selection. Some organisms fail & some succeed. Some are better equipped than others to meet tests of survival. We are born unfree and unequal to Nature: subject to physical and psychological heredity, diversely endowed in health, strength, mental capacity & character. Nature loves difference. Inequality grows with the complexity of civilization. Economic development specializes functions & differentiates abilities. Makes men unequally valuable to their group. Freedom & equality are sworn enemies. When one prevails the other dies. Utopias of equality are doomed. Third lesson is life must breed. Nature has no use for organisms that can’t reproduce. If there is too much supply of humans, 3 agents for restoring peace: famine, pestilence, war. Lower birth rates on other hand reduce economic & political power of the group within society. It is not the race that makes the civilization, it is the civilization that makes the people: circumstances geographical, economic, and political create a culture, and the culture creates a human type. History shows little alteration in the conduct of humankind. Means change, motives don’t. Rich & poor have the same impulses. Nothing more common than rebels in power adopting the methods that they condemned when they were still rebels. Evolution has been social not biological. The hero has a place in history in forming unstereotyped responses to new & unpredictable events. Conservative who resists change is as important as radical who proposes it. New ideas should be heard for the sake of the few that are good, but also need to go through the mill of objection & opposition. They have to survive the crucible. Moral codes differ because they adjust to the situation. Morals in hunter era were very different from agricultural era: greed, cruelty, polygamy. Agriculture regime required new virtues: industriousness > bravery, regularity > violence, peace > war, children = economic assets. Strong familial authority. Religion has many lives & a habit of resurrection. It prevails when laws are feeble and morals must bear the burden of maintaining social order. Fades with the power of law. There is no significant example in history, before our time, of a society successfully maintaining moral life without the aid of religion. The men who can manage men manage the men who can manage only things, and the men who can manage money manage all. Men are judged by their ability to produce — except in war, when they are ranked according to their ability to destroy. Majority of abilities is gathered in a minority of men. Concentration of wealth is a natural result, recurs in history. Rate of concentration varies with economic freedom permitted by morals & laws. Concentration may reach a point where strength of number in the many poor rivals the ability in the few rich. Critical juncture. Solved either by legislation redistributing wealth or revolution redistributing poverty. Then power/wealth concentrates again. This is the eternal cycle. Capitalist fulfilled a creative function: savings→productive capital, financed mechanization, created flow of goods from producer→consumer. History has had many socialist interludes: Sumeria, Egypt under Ptolemies, Rome under Docletian, China under Szuma Ch’ien and many others. Over time the two are getting closer. The fear of capitalism has compelled socialism to widen freedom, and the fear of socialism has compelled capitalism to increase equality. Men love freedom. Freedom of individuals requires some regulation of conduct. Hence first condition of freedom is its limitation. Make it absolute and it dies in chaos. Power naturally converges to the center as it’s ineffective when divided & spread. Monarchy is the most natural form of government, judged by prevalence in history. Democracies have been hectic interludes. Monarchy has a middling record. When hereditary, it leads to stupidity, nepotism, and extravagance. Most governments have been oligarchies: aristocracies (chosen by birth), theocracies (by religion), democracies (by wealth). It’s unnatural for a majority to rule because can’t be organized for united & specific action. Majority can do no more than periodically throw out the minority and set up another. History doesn’t justify revolutions. Effects would have in most cases come with economic developments. To break sharply with the past is to court the madness that may follow the shock of sudden blows or mutilations. Violent revolutions don’t redistribute wealth: they destroy it. Democracy is the most difficult of all forms of government, since it requires the widest spread of intelligence, and we forgot to make ourselves intelligent when we made ourselves sovereign. Democracy has embedded class conflict. Every advance in the complexity of the economy puts an added premium upon superior ability, and intensifies the concentration of wealth, responsibility, and political power. All deductions having been made, democracy has done less harm, and more good, than any other form of government. If equality of educational opportunity can be established, democracy will be real and justified. Though men cannot be equal, their access to education and opportunity can be made more nearly equal. The rights of man are not rights to office and power, but the rights of entry into every avenue that may nourish and test a man’s fitness for office and power. Cause of war is the same as cause of competition between individuals. The state has our instincts but not our restraints. States will unite in basic co-operation only when they are in common attacked from without. We may make contact with ambitious species on other planets or stars; soon thereafter there will be interplanetary war. Then, and only then, will we of this earth be one. History is littered with ruins of civilizations. Life has no inherent claim to eternity , whether in individuals or in states. History repeats itself, but only in outline & in the large. What does progress mean? If increase in happiness, then no. Define as increasing control of the environment by life. On a long-range view: table of mortality rates indicates their is progress. We idolize past civilizations but forget their high rates of infant mortality, short lifespan, great disease, etc. If education is the transmission of civilization, we are unquestionably progressing. Our finest contemporary achievement is our unprecedented expenditure of wealth and toil in the provision of higher education for all. If a man is fortunate he will, before he dies, gather up as much as he can of his civilized heritage and transmit it to his children. And to his final breath he will be grateful for this inexhaustible legacy, knowing that it is our nourishing mother and our lasting life. If you want an even more concise summary, I encourage you to check out Ben McCarthy’s great tweestorm. If you like this stuff, please consider following me on Twitter. Thanks! Early stage investor. 4-time Founder/CEO: @ChoiceVendor @parsableHQ. Crypto, AI, Marketplaces. ♥️ gritty founders, deep convos, and pandas.